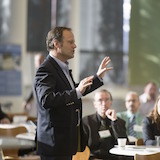 Making a good presentation is about constructing a charismatic message, making people respect you, and connecting with your audience. Know exactly who you’re trying to persuade. A presentation is about convincing people about something: an idea, an initiative, a course of action. Knowing your audience is the first step to making a good presentation. Select one clear idea that you want to communicate. Ideally, you should be able to say it in one sentence. Create three to five supporting points for this message. People have difficulty processing more than four points. For each supporting point, add an entertaining anecdote, fascinating fact, compelling statistic, great metaphor, example, or analogy. Stories have a very strong impact on people. To make your stories stronger, add characters that are similar to the audience. Make them entertaining to make them even better. When using numbers and statistics, make them personal, so the audience can relate to them. End the presentation on a high note, and avoid a Q&A. You might include a Q&A in the middle, so the presentation is more interactive. End it on a high note, not with a Q&A. While crafting sentences, remind yourself of the advice from Chapter 8. It’s all about them. Relate everything to them, not to you. Use graphics—the brain thinks in pictures. Avoid the “no problem” trap.